Having founded Philadelphia International Records in 1972, Gamble and Huff were about to embark on a musical journey that would see them change the musical landscape forevermore. While much of Philadelphia International Records’ success was down to Gamble and Huff’s undoubtable skills as songwriters and producers, all to often the role of M.F.S.B. in the label’s success is underestimated, and sometimes underplayed. Between 1972 and 1975, the original and classic lineup of M.F.S.B. played on every one of the label’s successful albums. Whether it was Billy Paul’s 360 Degrees of Billy Paul, The O’Jays Backstabbers, Ship Ahoy and Family Reunion, Harold Melvin and The Blue Notes’ I Miss You, Black and Blue and Wake Up Everybody or The Three Degrees’ The Three Degrees and International M.F.S.B. played on each of these classic albums. Then in 1975, after a dispute with Gamble and Huff over money, many of the classic lineup of M.F.S.B. left Philadelphia International Records and headed to New York, where they become The Salsoul Orchestra and played a huge part in Salsoul’s success. However, M.F.S.B. were much more than just Philadelphia International Records’ house-band, but a hugely successful group in their own right. Between their 1972 and 1980 M.F.S.B. released eight albums for Philadelphia International Records. M.F.S.B.’s recording career started with their eponymous debut album M.F.S.B., released in early 1973, which reached number 121 in the US Billboard 200 and number twenty in the US R&B Charts. Then in December 1973, M.F.S.B. released their seminal album Love Is The Message, which featured the classic, number one single TSOP (The Sound of Philadelphia). Before I tell you about M.F.S.B.’s sophomore album Love Is The Message, which will be released by BBR Records on 17th September 2012, I’ll tell you the background to the album. Although M.F.S.B’s debut album M.F.S.B, released early in 1973, had proved to be a commercial success, reaching number 121 in the US Billboard 200 and number twenty in the US R&B Charts, it hadn’t featured a successful single. This disappointed Gamble and Huff, who realized that a successful single would translate into album sales. 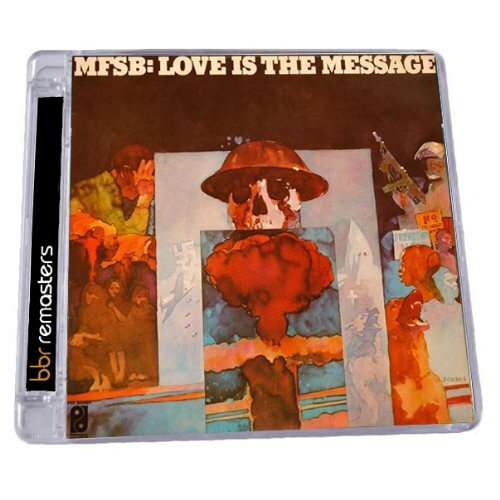 For M.F.S.B’s sophomore album, which would become Love Is The Message, they had no rethink their strategy for M.F.S.B. Then they heard that Don Cornelius television TV dance program Soul Train was changing. After securing sponsorship from Sears Roebuck, Don Cornelius premiered Soul Train in 1970. It was filmed and broadcast from Chicago, with Jerry Butler featuring on the first show. Soon, Soul Train become a successful TV show, attracting new sponsors, The Johnson Products Company whose sponsorship allowed the program to be syndicated across America. This meant Soul Train would now be filmed in Los Angeles and for this new beginning, a new theme song was needed. This was where Gamble and Huff came in. Gamble and Huff wrote the new theme tune, Soul Train. With people across America hearing the song every week, it worked its way into the nation’s consciousness. So, Gamble and Huff negotiated with Don Cornelius to license the song for Philadelphia International Records to release. A deal was struck, with the caveat that the name Soul Train couldn’t be used. So, Soul Train became TSOP (The Sound of Philadelphia). With Gamble and Huff looking for a hit single for M.F.S.B., TSOP (The Sound of Philadelphia) was just what they needed. M.F.S.B. had their next single sorted out, so work began on recording of their sophomore album Love Is The Message. For Love Is The Message the album was a mixture of new tracks and cover versions. Gamble and Huff only cowrote two tracks, but they turned out to be classics, Love Is The Message and TSOP (The Sound of Philadelphia). Bruce Hawkes and Jack Faith cowrote Bitter Sweet. The cover versions included Cheaper To Keep Her, My One and Only Love and Touch Me In the Morning. These six tracks, plus the two short tracks, Zach’s Fanfare completed M.F.S.B’s second album Love Is The Message. It would be recorded at Philly’s Sigma Sound Studios, where all of Gamble and Huff’s Philadelphia International Records’ albums were recorded. At Philly’s Sigma Sound Studios Gamble and Huff produced four tracks which were arranged by Bobby Martin, one of Philadelphia International Records’ best arrangers and producers. Vince Montana Jr. arranged and produced My One and Only Love, while Jack Faith arranged and produced Bitter Sweet. The lineup of M.F.S.B. which would play on Love Is The Message was the classic lineup. This included the Baker, Harris, Young rhythm section, guitarist Bobby “Electronic” Eli and T.J. Tindall,, percussionist Larry Washington, vibes virtuoso Vince Montana Jr and violinist Don Renaldo. The Three Degrees added vocals on TSOP (The Sound of Philadelphia) and Love Is the Message, the two hit singles from Love Is The Message. Together The Three Degrees and M.F.S.B. recorded the eight tracks on Love Is The Message, which was released in December 1973. On the release of M.F.S.B’s sophomore album Love Is The Message in December 1973, it reached number four in the US Billboard 200 and number one in the US R&B Charts. When TSOP (The Sound of Philadelphia) was released in February 1974, Gamble and Huff had their hit single for M.F.S.B. It reached number one in the US Billboard 100 and US R&B Charts, selling over one-million copies. In the UK, TSOP (The Sound of Philadelphia) reached just number twenty-two. When Love Is The Message was released as a single in June 1974, remarkably, it only reached number eighty-five in the US Billboard 100 and number forty-two in the US R&B Charts. However, Love Is The Message gave M.F.S.B. their most successful album and featured a dual number one single TSOP (The Sound of Philadelphia). What made Love Is The Message such a successful album? Opening M.F.S.B’s most successful album Love Is The Message is the twenty-three second Zach’s Fanfare, where a roll of Earl Young’s drums, bursts of blazing horns and dramatically and enthusiastically, a musical equivalent of a fairground barker announces “ladies and gentlemen Gamble and Huff proudly present M.F.S.B.” With that tympani, joining the horn and rhythm section, the drama builds and builds, leaving you anticipating the seven tracks still to come. Why the title-track Love Is The Message never fared better on its release has always been something of a mystery to me. With Gamble and Huff producing and writing the track, Bobby Martin arranging it and M.F.S.B. in all their glory, kicking loose and letting the world hear their considerable talents Philly Soul doesn’t get much better. When the track opens it’s a mass of the lushest strings, blazing horns, percussion and the pounding Baker, Harris, Young rhythm section. From its soulful beginnings, the track quickly decides to reveal its drama and delights. On the signal of Earl Young’s drums, a sizzling saxophone solo from Zach Zachary enters, while Lenny Pakula’s Hammond adds atmosphere. After that, the track briefly heads in a direction marked funk, before returning to its soulful sound. Strings sweep and swirl, horns blaze and growl, while Vince Montana Jr, adds the unmistakable sound of his vibes. Providing the track’s pulsating heartbeat is Baker, Harris, Young rhythm section. Later, the Three Degrees add their soulful strains, as M.F.S.B. combine soul, funk and jazz seamlessly. You can’t help but be hugely impressed by the combined talents of M.F.S.B, as they create track that’s blessed with a contemporary, timeless sound, that sounds as good today as in 1973. Cheaper To Keep Her is a cover of a track made famous by Johnny Taylor on Stax Records. Originally written in 1953, M.F.S.B. with Gamble and Huff producing and Bobby Martin arranging, take the track back to its jazz roots. Stabs of Lenny Pakula’s Hammond organ, Ronnie Baker’s wandering bass, percussion and Vince Montana Jr’s vibes combine as M.F.S.B. are transformed into a big band. Horns blaze, while a jazzy piano solo drifts in and out. All the time, the Baker, Harris, Young create the track’s jazzy backbeat, while the Hammond organ, stabs of big kicking horns and percussion are ever-present. It’s very much a “team effort,” with each of M.F.S.B. playing their part in the track’s sound and success. Later, Vince Montana Jr. steps up, laying down one of his trademark solos, playing his part in this glorious sounding track that’s sounds as if it’s from another era. Vibes virtuoso Vince Montana Jr, takes charge of arranging and production duties on My One and Only Love. The tempo drops a beautiful saxophone solo combining with the Baker, Harris, Young rhythm section, Vince Montana Jr,’s vibes and the lushest of strings. Saxophonist Zach lays down one of the best solos he’d play on an M.F.S.B. album. Later, a stab of Lenny Pakula’s Hammond organ signal’s Vince Montana Jr’s vibes solo to begin. Not to be outdone, Vince plays down an equally spellbinding solo, while strings sweep slowly and Ron Baker’s bass helps give the track its vintage sound. Norman Harris then plays one of his jazzy guitar solos, before Zach rejoins. Together they demonstrate just how fortunate Gamble and Huff were to have such talented personnel and in the process, create an absolutely gorgeous track. TSOP (The Sound of Philadelphia) gave M.F.S.B. the hit single Gamble and Huff wanted for them, reaching number one in the US Billboard 100 and US R&B Charts, selling one-million copies. Written and produced by Gamble and Huff, Bobby Martin arranged it and The Three Degrees added vocals. With strings, swirling and sweeping, dancing with delight, horns rasp and growl, while the Baker, Harris, Young rhythm section’s pounding rhythm section drive the track along. Stabs of Lenny Pakula’s Hammond organ, a sprinkling of Larry Washington’s percussion join the punchy horns and cascading strings, as M.F.S.B. are like a musical Soul Train charging down the tracks. Norman Harris adds his jazz-tinged guitar, Vince Montana Jr, adds vibes, while Ron Baker’s bass and Earl Young’s bass unite. Later, the Three Degrees add sweet, soulful, soaring harmonies. Their elegant sound is just the finishing touch, drifting in and out and a quite beautiful contrast. It seems everyone brought their A-Game to the session, where M.F.S.B. create a fusion of soul and funk that would become a classic track. Indeed, this isn’t just Love Is The Message’s Magnus Opus, but one of Philadelphia International Records’ greatest recordings. It’s almost impossible to followup the previous track, so Zach’s Fanfare is the perfect curveball. For just under a minute, Interlude sees M.F.S.B. enter a time-machine and are transported back in time, becoming an old style big band. Horns bray and rasp, while Baker, Harris, Young provide the track’s jazz-drenched heartbeat as the track unfolds at breakneck speed. All too soon, the track is over and you’re left wondering what this song could’ve become and what an album like this would’ve sounded like? Touch Me In the Morning is another standard that’s been covered by many artists, but here, with Gamble and Huff producing and Bobby Martin arranging M.F.S.B. deliver a dramatic and then joyous track where jazz, soul and funk unite. Emotive strings, Zach’s impassioned alto saxophone solo and stabs of Lenny Pakula’s Hammond organ combine, before Earl Young’s thunderous drums signal all change. Earl’s drums and blazing horns combine before Vince Montana Jr,’s vibes, Ronnie Baker’s deliberate bass and the saxophone take charge. Now, M.F.S.B. kick loose and the sound is truly glorious. Flourishes of piano, sweeping, swirling strings, percussion and Norman Harris’ searing, jazzy guitar solo are all crucial to Bobby Martin’s arrangement. All the time Earl’s drums and Ronnie’s bass anchor the track, while Zach’s searing, blazing saxophone solo is breathtaking in its power, drama and the emotion it stirs. For over six minutes you’re taken on musical roller-coaster journey where drama, emotion and joy are your constant companions, while M.F.S.B. provide the stirring, stunning soundtrack. Closing Love Is The Message is Bitter Sweet, written and produced by Bruce Hawkes and Jack Faith, who arranged the track. Jack Faith’s role in the Philadelphia International Records’ success story is too often overlooked, but he was a hugely talented songwriter, arranger, producer and musician. Again the tempo is dropped, with the arrangement having a dramatic, jazz-tinged sound. Another change is the tempo, which starts in 3/4 time, which for non-musicians is like a waltz. Midway through the track the tempo changes to 4/4 time. A rasping saxophone, the Baker, Harris, Young rhythm section, keyboards, woodwind and cascading strings combine to create a dramatic, jazzy arrangement in 3/4 time. All the time, Earl’s drums and Ron’s bass anchor the track. Floaty strings add beauty, contrasting the growling horns. Then with Ron and Earl combining, the tempo changes to 4/4 and things get funkier. Braying horns, a funky rhythm section, elegant strings, percussion and Vince’s vibes combine, before Zach blows another blazing saxophone solo. Vince then not to be outdone, lays down an equally impressive vibes solo, as M.F.S.B. bring Love Is The Message to a dramatic and memorable ending. Of the eight albums M.F.S.B. released, Love Is The Message wasn’t just the most critically acclaimed and commercially successful, but their seminal album. Describing Love Is The Message as a classic doesn’t do the album justice. Instead, Love Is The Message is more like a Magnus Opus, and a demonstration of the combined talents and versatility of M.F.S.B. Whether it was Philly Soul, jazz, funk or even big band music, M.F.S.B. were just as comfortable playing it. M.F.S.B. could switch seamlessly between genres, and on Bitter Sweet, between time signatures. Nowadays, many musicians struggle with 4/4 tempo, while M.F.S.B. switched from 3/4 time to 4/4 time. For non-musicians that’s quite an achievement and something only truly gifted and talented musicians are capable of. Mind you with some of Philly’s finest musicians, including the Baker, Harris, Young rhythm section, Bobby “Electronic” Eli, T.J. Tindall, Vince Montana Jr, Larry Washington, Jack Faith and Don Renaldo playing on Love Is the Message, it’s no surprise the album sold over one-million copies. Playing their part in the success of Love Is the Message were The Three Degrees, who added vocals on Love Is the Message and TSOP (The Sound of Philadelphia). Of course Gamble and Huff’s contribution as songwriters and producers can’t be underestimated. By 1973, Gamble and Huff were going through the hottest, most successful period of their career. However, arrangers Bobby Martin and Jack Faith, who wrote and produced Bitter Sweet with Bruce Hakes, roles can’t be underestimated. Both Jack and Bobby would play an important part the Philadelphia International Records’ success story. That success story was based upon the combined talents of the arrangers, producers, songwriters and of course, the musicians, namely M.F.S.B. Look at any Philadelphia International Records’ album from this period and the same musicians played on each album. Less than two years after the release of Love Is The Message, Gamble and Huff forgot that: “the workman is worthy of his hire.” They were locked in a dispute with many members of M.F.S.B. over money. When the dispute couldn’t be resolved, many of M.F.S.B. headed less than one-hundred miles away to New York, becoming The Sasoul Orchestra. Ironically for Gamble and Huff, The Salsoul Orchestra proved crucial in the rise and rise of Salsoul Records, replicating the success Gamble and Huff were enjoying when M.F.S.B. when Love Is The Message was released. Although the original lineup of M.F.S.B. would released further albums, Love Is The Message which will be released by BBR Records on 17th September 2012 is their greatest album, their Magnus Opus. On Love Is The Message are two classic songs, TSOP (The Sound of Philadelphia) and Love Is the Message, which demonstrates the combined and many talents of the greatest house-bands in music M.F.S.B. Standout Tracks: Love Is The Message, Cheaper To Keep Her, My One and Only Love and TSOP (The Sound of Philadelphia).